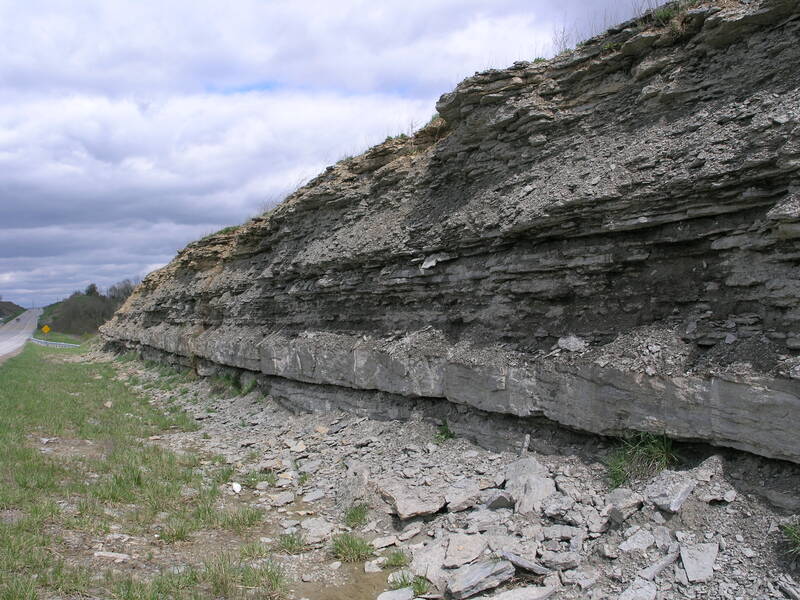 Every other spring, the Department of Geological Sciences alumni converge on Athens for a weekend of networking and reunions that is centered around a full day symposium where alumni, students, and faculty share their current work. This year, our Alumni Board chose to focus on Women in Geology and asked me to give a presentation on that topic. I was delighted to develop a presentation on this topic as it’s both near and dear to my heart (and career), and I have published several pieces on gender issues in paleontology previously (GSA Today, Priscum). So I spent the better part of two weeks diving back into the literature on implicit bias, structural barriers to women, and locating data on women at the student through professional levels. I will say, for the record, this topic is not fun to dive into. It is important and I hoped that I could make a contribution by educating our alumni broadly about these issues, but it is emotionally taxing to read study after study showing empirical data for continuing bias in geoscience—and science in general. I focused on my presentation on data. 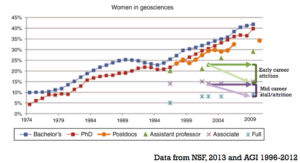 Data that demonstrate that: YES we have many women training to be geologists (nearly 45% of undergraduates), so we are developing a strong pool of qualified female geologists. But the data also demonstrate that NO these women are not fully participating in the geoscience workforce, which his only 23% female. That disparity CANNOT be explained by historical biases alone. Women have been earning nearly half of geoscience degrees for at least the past 15 years, but the junior work force does not match the training pool. So I explored the reasons for this starting with overt discrimination (which is present, but less common than in decades past), sexual harassment, gendered critiques, implicit bias, and structural barriers. These issues create feedback loops that instill lower self-confidence and greater workloads for women and ultimately push women out of the workforce. Implicit bias, in which individuals allow ingrained stereotypes to unconsciously bias our opinions and decisions, is a significant problem. If you are not familiar with implicit bias, here are a series of empirical studies you can read. I’m particularly fond of this one about hurricane names (Jung et al., 2014) and this about lab tech hiring (Moss-Racusin et al., 2012). Implicit bias is difficult because we all have it—it’s a societal issue, not a male vs. female issue. You can assess your level of implicit bias using a set of online quizzes at projectimplicit.net. But if we each individually learn to recognize our bias, we can then take steps to mitigate that in hiring decisions, reference letters, etc. For example, here are tips to avoid bias in reference letters that frequently consult. 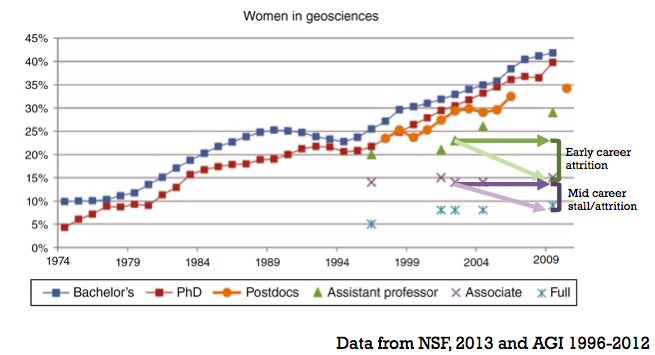 Overall, women are in a much stronger position within the geosciences than ever before. 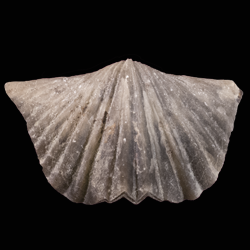 We are making strides toward parity, and if men and women work together to remove the barriers to full participation by women (and other gender identities) in geoscience, our field will be even stronger. Although, I–like all women in science–could spend hours detailing specific events of bias during my career, they have not prevented me from becoming the scientist, I am today. Rather, some things have molded me to be a more determined advocate for myself, my students, and our community as a whole. So I spent my presentation detailing the data to help others understand both the need for change and how we can all work together to improve our field for all people and to build a science combining a broader breadth of ideas and experiences. I am very fortunate to belong to a very supportive department and to be able to contribute to mentoring the next generation of geoscientists. *I have not discussed racial diversity in this post. Similar proportional increases in number of geoscience degrees earned are NOT occurring for minority groups in geoscience. All the structural and implicit barriers discussed impact racial diversity as well as a series of additional constraints. More on this later.